Space shuttle Discovery has landed in Florida after an eventful 15-day mission to the International Space Station (ISS). The crew touched down at 1301 ET (1801 GMT) at the Kennedy Space Center. During their time at the orbiting outpost, the shuttle's crew delivered a new unit, dropped off a new resident and completed a series of spacewalks. During one of the spacewalks, a rip was discovered in one of the ISS's solar panels but was later repaired. 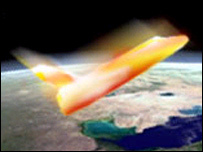 During its 60-minute descent back to Earth, Discovery would have reached speeds of up to 30 times the speed of sound. When ground control gave the green light for the shuttle to return, commander Pam Melroy fired the craft's engines in a two-minute "deorbit burn" at 1259 local time (1659 GMT) to slow its speed. Earlier, Nasa officials reported no damage to the shuttle's insulation tiles that protected the orbiter from temperatures of up to 1,649C (3,000F) as it re-entered the atmosphere. The orbiter undertook several steep banking manoeuvers during its return to help slow it down to its landing speed of about 220 mph (350 km/h). The STS-120 mission brought up the Harmony module from Earth. It is a passageway that will link present and future science laboratories on the orbiting outpost. Harmony was fitted to a temporary berth during one of the four spacewalks carried out during Discovery's stay. The module will be moved to its permanent position on the ISS structure next week. During the third spacewalk, the crews repositioned a huge girder and solar array tower, only to find a rip in one of the wings of the energy-collecting unit. With advice from ground engineers, the crews were able to work up a repair solution that involved dangling spacewalker Scott Parazynski out over the split panel to lash the damaged area together. 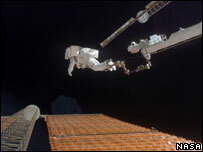 The repair meant the crews were able to fully deploy the solar array. The dramatic spacewalk has allowed the US space agency to press on with plans to launch its Atlantis orbiter in December. This is the high-profile mission that will bring Europe's major contribution to the ISS - its Columbus laboratory. This will be fitted to the Harmony node. Once undocked, Discovery flew around the station to film its new configuration. It is returning to Earth with ISS resident Clayton Anderson, who has spent five months on the platform. His place has been taken by Daniel Tani, who came up with Discovery to start a two-month tour.